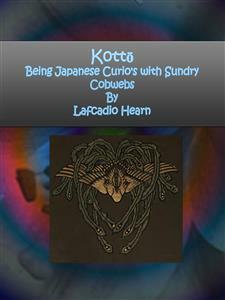 Kottō: Being Japanese Curio's with Sundry Cobwebs written by Lafcadio Hearn who was a writer, known best for his books about Japan, especially his collections of Japanese legends and ghost stories. This book was published in 1902. And now republish in ebook format. We believe this work is culturally important in its original archival form. While we strive to adequately clean and digitally enhance the original work, there are occasionally instances where imperfections such as missing pages, poor pictures or errant marks may have been introduced due to either the quality of the original work. Despite these occasional imperfections, we have brought it back into print as part of our ongoing global book preservation commitment, providing customers with access to the best possible historical reprints. We appreciate your understanding of these occasional imperfections, and sincerely hope you enjoy reading this book. The following nine tales have been selected from the "Shin-Chomon-Shū" "Hyaku Monogatari," "Uji-Jūi-Monogatari-Shō," and other old Japanese books, to illustrate some strange beliefs. They are only Curios. Near the village of Kurosaka, in the province of Hōki, there is a waterfall called Yurei-Daki, or The Cascade of Ghosts. Why it is so called I do not know. Near the foot of the fall there is a small Shintō shrine of the god of the locality, whom the people name Taki-Daimyōjin; and in front of the shrine is a little wooden money-box—saisen-bako—to receive the offerings of believers. And there is a story about that money-box. One icy winter's evening, thirty-five years ago, the women and girls employed at a certain asa-toriba, or hemp-factory, in Kurosaka, gathered around the big brazier in the spinning-room after their day's work had been done. Then they amused themselves by telling ghost-stories. By the time that a dozen stories had been told, most of the gathering felt uncomfortable; and a girl cried out, just to heighten the pleasure of fear, "Only think of going this night, all by one's self, to the Yurei-Daki!" The suggestion provoked a general scream, followed by nervous bursts of laughter.... "I'll give all the hemp I spun to-day," mockingly said one of the party, "to the person who goes!" "So will I," exclaimed another. "And I," said a third. "All of us," affirmed a fourth.... Then from among the spinners stood up one Yasumoto O-Katsu, the wife of a carpenter;—she had her only son, a boy of two years old, snugly wrapped up and asleep upon her back. "Listen," said O-Katsu; "if you will all really agree to make over to me all the hemp spun to-day, I will go to the Yurei-Daki." Her proposal was received with cries of astonishment and of defiance. But after having been several times repeated, it was seriously taken. Each of the spinners in turn agreed to give up her share of the day's work to O-Katsu, providing that O-Katsu should go to the Yurei-Daki. "But how are we to know if she really goes there?" a sharp voice asked. "Why, let her bring back the money-box of the god," answered an old woman whom the spinners called Obaa-San, the Grandmother; "that will be proof enough." "I'll bring it," cried O-Katsu. And out she darted into the street, with her sleeping boy upon her back. "Oi! O-Katsu-San!" suddenly called a warning voice above the crash of the water. O-Katsu stood motionless,—stupefied by terror. "Oi! O-Katsu-San!" again pealed the voice,—this time with more of menace in its tone. But O-Katsu was really a bold woman. At once recovering from her stupefaction, she snatched up the money-box and ran. She neither heard nor saw anything more to alarm her until she reached the highroad, where she stopped a moment to take breath. Then she ran on steadily,—pichà-pichà,—till she got to Kurosaka, and thumped at the door of the asa-toriba. How the women and the girls cried out as she entered, panting, with the money-box of the god in her hand! Breathlessly they heard her story; sympathetically they screeched when she told them of the Voice that had called her name, twice, out of the haunted water.... What a woman! Brave O-Katsu!—well had she earned the hemp!... "But your boy must be cold, O-Katsu!" cried the Obaa-San, "let us have him here by the fire!" "He ought to be hungry," exclaimed the mother; "I must give him his milk presently."... "Poor O-Katsu!" said the Obaa-San, helping to remove the wraps in which the boy had been carried,—"why, you are all wet behind!" Then, with a husky scream, the helper vociferated, "Arà! it is blood!" The exclamation Oi! Is used to call the attention of a person: it is the Japanese equivalent for such English exclamations as "Halloa!" "Ho, there!" etc. Have you ever attempted to mount some old tower stairway, spiring up through darkness, and in the heart of that darkness found yourself at the cobwebbed edge of nothing? Or have you followed some coast path, cut along the face of a cliff, only to discover yourself, at a turn, on the jagged verge of a break? The emotional worth of such experience—from a literary point of view—is proved by the force of the sensations aroused, and by the vividness with which they are remembered. Now there have been curiously preserved, in old Japanese story-books, certain fragments of fiction that produce an almost similar emotional experience.... Perhaps the writer was lazy; perhaps he had a quarrel with the publisher; perhaps he was suddenly called away from his little table, and never came back; perhaps death stopped the writing-brush in the very middle of a sentence. But no mortal man can ever tell us exactly why these things were left unfinished.... I select a typical example. On the fourth day of the first month of the third Tenwa,—that is to say, about two hundred and twenty years ago,—the lord Nakagawa Sado, while on his way to make a New Year's visit, halted with his train at a tea-house in Hakusan, in the Hongō district of Yedo. While the party were resting there, one of the lord's attendants,—a wakatō named Sekinai,—feeling very thirsty, filled for himself a large water-cup with tea. He was raising the cup to his lips when he suddenly perceived, in the transparent yellow infusion, the image or reflection of a face that was not his own. Startled, he looked around, but could see no one near him. The face in the tea appeared, from the coiffure, to be the face of a young samurai: it was strangely distinct, and very handsome,—delicate as the face of a girl. And it seemed the reflection of a living face; for the eyes and the lips were moving. Bewildered by this mysterious apparition, Sekinai threw away the tea, and carefully examined the cup. It proved to be a very cheap water-cup, with no artistic devices of any sort. He found and filled another cup; and again the face appeared in the tea. He then ordered fresh tea, and refilled the cup; and once more the strange face appeared,—this time with a mocking smile. But Sekinai did not allow himself to be frightened. "Whoever you are," he muttered, "you shall delude me no further! "—then he swallowed the tea, face and all, and went his way, wondering whether he had swallowed a ghost. "I am Shikibu Heinai—met you to-day for the first time.... You do not seem to recognize me." He spoke in a very low, but penetrating voice. And Sekinai was astonished to find before him the same sinister, handsome face of which he had seen, and swallowed, the apparition in a cup of tea. It was smiling now, as the phantom had smiled; but the steady gaze of the eyes, above the smiling lips, was at once a challenge and an insult. "No, I do not recognize you," returned Sekinai, angry but cool;—"and perhaps you will now be good enough to inform me how you obtained admission to this house?" "Ah, you do not recognize me!" exclaimed the visitor, in a tone of irony, drawing a little nearer as he spoke. "No, you do not recognize me! Yet you took upon yourself this morning to do me a deadly injury!..." Sekinai instantly seized the tantō at his girdle, and made a fierce thrust at the throat of the man. But the blade seemed to touch no substance. Simultaneously and soundlessly the intruder leaped sideward to the chamber-wall, and through it! ... The wall showed no trace of his exit. He had traversed it only as the light of a candle passes through lantern-paper. When Sekinai made report of the incident, his recital astonished and puzzled the retainers. No stranger had been seen either to enter or to leave the palace at the hour of the occurrence; and no one in the service of the lord Nakagawa had ever heard of the name "Shikibu Heinai." "Our names are Matsuoka Bungō, Tsuchibashi Bungō, and Okamura Heiroku. We are retainers of the noble Shikibu Heinai. When our master last night deigned to pay you a visit, you struck him with a sword. He was much will hurt, and has been obliged to go to the hot springs, where his wound is now being treated. But on the sixteenth day of the coming month he will return; and he will then fitly repay you for the injury done him...."
Here the old narrative breaks off; the rest of the story existed only in some brain that has been dust for a century. I am able to imagine several possible endings; but none of them would satisfy an Occidental imagination. I prefer to let the reader attempt to decide for himself the probable consequence of swallowing a Soul. The armed attendant of a samurai was thus called. The relation of the wakatō to the samurai was that of squire to knight. The shorter of the two swords carried by samurai. The longer sword was called katana. Once there lived upon the mountain called Atagoyama, near Kyoto, a certain learned priest who devoted all his time to meditation and the study of the sacred books. The little temple in which he dwelt was far from any village; and he could not, in such a solitude, have obtained without help the common necessaries of life. But several devout country people regularly contributed to his maintenance, bringing him each month supplies of vegetables and of rice. "Friend, I must tell you that wonderful things have happened here since the last time I saw you. I do not certainly know why such things should have happened in my unworthy presence. But you are aware that I have been meditating, and reciting the sûtras daily, for many years; and it is possible that what has been vouchsafed me is due to the merit obtained through these religious exercises. I am not sure of this. But I am sure that Fugen Bosatsu comes nightly to this temple, riding upon his elephant.... Stay here with me this night, friend; then you will be able to see and to worship the Buddha." So the hunter remained at the temple. But while the priest was engaged in his religious exercises, the hunter began to think about the promised miracle, and to doubt whether such a thing could be. And the more he thought, the more he doubted. There was a little boy in the temple,—an acolyte,—and the hunter found an opportunity to question the boy. "Six times, already," the acolyte replied, "I have seen and reverently worshipped Fugen Bosatsu." This declaration only served to increase the hunter's suspicions, though he did not in the least doubt the truthfulness of the boy. He reflected, however, that he would probably be able to see whatever the boy had seen; and he waited with eagerness for the hour of the promised vision. Shortly before midnight the priest announced that it was time to prepare for the coming of Fugen Bosatsu. The doors of the little temple were thrown open; and the priest knelt down at the threshold, with his face to the east. The acolyte knelt at his left hand, and the hunter respectfully placed himself behind the priest. It was the night of the twentieth of the ninth month,—a dreary, dark, and very windy night; and the three waited a long time for the coming of Fugen Bosatsu. But at last a point of white light appeared, like a star, in the direction of the east; and this light approached quickly,—growing larger and larger as it came, and illuminating all the slope of the mountain. Presently the light took shape—the shape of a being divine, riding upon a snow-white elephant with six tusks. And, in another moment, the elephant with its shining rider arrived before the temple, and there stood towering, like a mountain of moonlight,—wonderful and weird. Then the priest and the boy, prostrating themselves, began with exceeding fervour to repeat the holy invocation to Fugen Bosatsu. But suddenly the hunter rose up behind them, bow in hand; and, bending his bow to the full, he sent a long arrow whizzing straight at the luminous Buddha, into whose breast it sank up to the very feathers. Immediately, with a sound like a thunder-clap, the white light vanished, and the vision disappeared. Before the temple there was nothing but windy darkness. "O miserable man!" cried out the priest, with tears of shame and despair, "O most wretched and wicked man! What have you done?—what have you done?" "Reverend sir, please try to calm yourself, and listen to me. You thought that you were able to see Fugen Bosatsu because of some merit obtained through your constant meditations and your recitation of the sûtras. But if that had been the case, the Buddha would have appeared to you only—not to me, nor even to the boy. I am an ignorant hunter, and my occupation is to kill;—and the taking of life is hateful to the Buddhas. How then should I be able to see Fugen Bosatsu? I have been taught that the Buddhas are everywhere about us, and that we remain unable to see them because of our ignorance and our imperfections. You—being a learned priest of pure life—might indeed acquire such enlightenment as would enable you to see the Buddhas; but how should a man who kills animals for his livelihood find the power to see the divine? Both I and this little boy could see all that you saw. And let me now assure you, reverend sir, that what you saw was not Fugen Bosatsu, but a goblinry intended to deceive you—perhaps even to destroy you. I beg that you will try to control your feelings until daybreak. Then I will prove to you the truth of what I have said." The priest, although a learned and pious person, had easily been deceived by a badger. But the hunter, an ignorant and irreligious man, was gifted with strong common sense: and by mother-wit alone he was able at once to detect and to destroy a dangerous illusion. Formerly, in the quarter of Reiganjima, in Yedo, there was a great porcelain shop called the Setomonodana, kept by a rich man named Kihei. Kihei had in his employ, for many years, a head clerk named Rokubei. Under Rokubei's care the business prospered;—and at last it grew so large that Rokubei found himself unable to manage it without help. He therefore asked and obtained permission to hire an experienced assistant; and he then engaged one of his own nephews,—a young man about twenty-two years old, who had learned the porcelain trade in Osaka. The nephew proved a very capable assistant,—shrewder in business than his experienced uncle. His enterprise extended the trade of the house, and Kihei was greatly pleased. But about seven months after his engagement, the young man became very ill, and seemed likely to die. The best physicians in Yedo were summoned to attend him; but none of them could understand the nature of his sickness. They prescribed no medicine, and expressed the opinion that such a sickness could only have been caused by some secret grief. "I have been thinking that, as you are still very young, you might have formed some secret attachment which is making you unhappy,—perhaps even making you ill. If this be the truth, you certainly ought to tell me all about your troubles. Here I stand to you in the place of a father, as you are far away from your parents; and if you have any anxiety or sorrow, I am ready to do for you whatever a father should do. If money can help you, do not be ashamed to tell me, even though the amount be large. I think that I could assist you; and I am sure that Kihei would be glad to do anything to make you happy and well." "Never in this world can I forget those generous words. But I have no secret attachment—no longing for any woman. This sickness of mine is not a sickness that doctors can cure; and money could not help me in the least. The truth is, that I have been so persecuted in this house that I scarcely care to live. Everywhere—by day and by night, whether in the shop or in my room, whether alone or in company—I have been unceasingly followed and tormented by the Shadow of a woman. And it is long, long since I have been able to get even one night's rest. For so soon as I close my eyes, the Shadow of the woman takes me by the throat and strives to strangle me. So I cannot sleep...."
"And why did you not tell me this before?" asked Rokubei. "Because I thought," the nephew answered, "that it would be of no use to tell you. The Shadow is not the ghost of a dead person. It is made by the hatred of a living person—a person whom you very well know." "What person?" questioned Rokubei, in great astonishment. "The mistress of this house," whispered the youth,—"the wife of Kihei Sama.. .. She wishes to kill me."